What fun January was! We enjoyed our beautiful country property, animals and it’s garden; had time with family in Sydney and Melbourne; caught up with old friends and competed in the Geelong Race Week regatta. I was also in a thinking, reflective, creating state for the whole month, culminating in a three-day Women’s Discovery Programme at Gwingana Lifestyle Retreat in the Gold Coast hinterland. I went with my cousin who has also had breast cancer. Not only was it time out for reflection on what the year ahead may hold for both of us, it was a time to have fun enjoying fitness activity, nature, “Dreamtime” each afternoon, fabulous healthy food and hugely informative lectures on health and wellness. 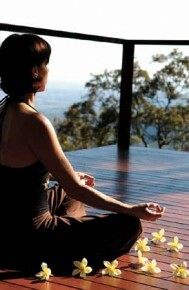 From the moment I arrived at Gwingana, I felt I had chosen the right retreat and location for us. We both wanted to move on from our breast cancer experience and start a new phase of our lives. Our programme included three lectures and a forum with Dr Karen Coates, a GP, obstetrician, gynaecologist and nutritional and environmental medicine practitioner. We had the opportunity to request some lecture subjects up front. Breast cancer and it’s treatments were something we wanted to hear and ask about and we did. The second was stress. How it manifests in the body (through adrenalin and cortisol production) and impacts our immune system and ‘gut health’. I completely tuned in to this. For a long time I have thought and felt that illness, particularly cancer, is caused by stress and our bodies being overloaded. Our second day talk was on cancer and how to give yourself the best chance of staying well and ‘cancer free’ post diagnosis and treatment. The power of positive thinking is one of the key factors in healing. The following research statistics astonished me and provided me with the biggest gift of the retreat. Following a ‘natural treatment’ course is almost as effective as taking pharmaceutical drugs to keep me ‘cancer free’. I have been following points 2-5 for the past 18 months. To have my intuitive approach, which is supported and guided by my integrative doctor, confirmed by another highly regarded practitioner gave me a renewed confidence in myself and the path I’m on. Last December I had started to doubt myself with each little ache that showed up in the left side of my body. Also the fluid level in my body began to rise with the hot Sydney weather and I was diagnosed with early lymphoedema. I then started to worry and wonder whether I was regressing. No, I wasn’t regressing, I just had ‘noise’ in my head creating mischief and worry. At Gwingana, I danced, meditated, walked, reflected, listened, relaxed and came away lighter in mind, body and spirit, ready to start a new business. I have been working on my ideas ever since – thinking, planning, talking, researching and networking. I’m excited and energised with a renewed zest for life. I feel I have truly ‘come out the other side’, having learnt an enormous amount about myself and wellness.The old enthusiastic me is back. However I am more loving, thoughtful and connected with myself and am present to the love in the world around me. This has been the greatest gift I have received from my brush with cancer. This entry was posted in Cancer and Treatments and tagged Breast cancer, cruciferous vegetables, Dr Karen Coates, gut health, Gwingana Lifestyle Retreat, Immune system, integrative doctor, lymphoemdma, nutritional and environmental medicine, optimal wellness, positive thinking, stress, vigorous exercise, vitamin D by Intuitive Living. Bookmark the permalink. It is wonderful to see such good results from a natural approach..I have started to follow this path for health issues I am experiencing now .. Lymphedema being one .. I need to return to the basics.. I am starting with a trip to the Hopewood retreat to detox as I truly believe that our bodies at times need to clear the toxic overload.. I will then follow similar steps to you but for me it is to repair an Auto immune disorder.. May 2014 be a Happy Healthy year for you.. Thank you Helen. Good luck with your healthy recovery path. I have been advised that acupuncture can help with fluid elimination and the healing of lymph oedema. I have Japanese acupuncturist. Dr Karen says good ‘gut health’ can assist in repairing the auto immune system. Do you have a good nutritionist? Every best wish to you for a healthy 2014.